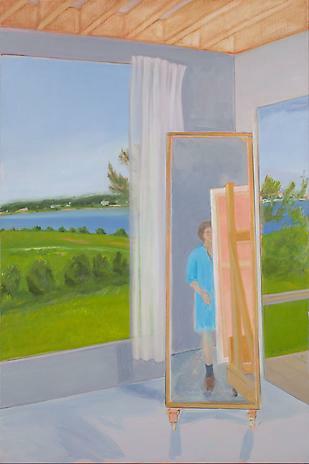 Margaret Montgomery: Tibor De Nagy Gallery's Jane Freilicher Show, "A Painter Among Poets." Tibor De Nagy Gallery's Jane Freilicher Show, "A Painter Among Poets." Painter in the Studio, 1987. As to Freilicher, O'Hara and Ashbery, there is an informality to all their work. Freilicher's paintings have a seemingly accidental quality, as if a scene had just been happened upon. Her friends' respective poetry has a similarly casual, incidental quality. Freilicher's paintings seem intimate, personal. They present the sights and things of everyday as they might be casually glanced: The views from Freilicher's windows in New York and out on Long Island; flowers and personal nicknacks----all recurring motifs in her work. All presented in informal compositions that can have an awkward quality; sometimes planes don't quite align, foregrounds are viewed from above, backgrounds from eye level; even within planes the perspective isn't always consistent, shifting from different angles. This gives the paintings a slightly random and dissolute quality, like something only partially, or quickly, glanced. 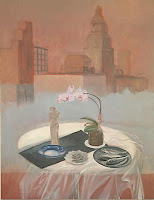 In some, particularly those that combine a still life with a landscape or cityscape viewed through a window, the motifs are incongruously juxtaposed, imbuing them with a surreal aspect. Likewise, O'Hara's and Ashbery's respective poetry presents the mundane stuff of personal experience in all its incongruity. Parts of a world, 1987. The show includes several examples of Freilicher's juxtapositions of interior and exterior views. Combining the two is a recurring compositional device for her, enabling her to juxtapose incongruous surreal elements, such as can be seen in "Parts of the World," 1987 or "Crosstown View, 1978. In both, a table laden with objects appears in the foreground, in front of a window view of a cityscape. Thus allowing Freilicher to play with scale. She is able to present the personal and intimate as monumental, dwarfing the city's skyscrapers. There is something particularly fun and theatrical about her still lifes. Viewed in closeup against the city skyline, they have a Magritte apple-in-the-sky aspect without actually departing from the laws of gravity. There are also several landscapes here that show the influence of abstract expressionism, such as her "Cover Crop," 1963, which has gestural flourishes that are reminiscent of some of de Kooning's work. But in Freilicher's paintings the gestural figurations seem merely dreamy and atmospheric. Her most abstracted paintings in the show, "Henry Ford's Dunes,"1961 and "Abstract Landscape," 1963 seem more ethereal and mirage-like than nonrepresentational: As if the view had been obscured by a dense fog. In addition to Freilicher's paintings, including portraits of the poets and some poems they wrote about her, the gallery also presents postcards and other scribblings she and her friends wrote to each other. Personally, I thought there was too much of that in the show. Much of it had the feel of inside jokes----"you-had-to-have-been- there..." kind of humor. Although that stuff did mirror the general informality and humorousness of Freilicher's paintings, it seemed unnecessary. One thing that is obvious from the show although it isn't actually mentioned, is that Freilicher and poets O'Hara and Ashbery focused on the personal and everyday to the exclusion of the political and social issues of their day; unlike the more cutting edge artists and writers of the sixties and on. That makes their respective work seem somewhat insular at times. But what consistently comes across is a light-hearted, genuine joie de vivre. And, an appreciation for the absurdities of everyday life. If you see the show, Freilicher's paintings will surely leave you smiling. The show is at the Tibor de Nagy Gallery, 724 Fifth Avenue, NY, NY. It continues until June 14.